As H1N1 continues to spread on campus, Harvard researchers have taken on important roles shaping the response to the swine flu outbreak that continues to capture national headlines. Researchers like Marc Lipsitch at the School of Public Health are estimating that, for all the hysteria surrounding the illness, this season’s death rate from H1N1 may not differ substantially from that of a moderate seasonal flu epidemic. Lipsitch, an epidemiology professor, currently leads a team of biostatisticians, research scientists, and doctors who have spent the last five months estimating the transmissibility and severity of the virus. But with the peak of flu season fast approaching, such predictions will soon be put to test. And with a mild outcome far from a lock, a slew of other researchers with Harvard ties are investigating the vaccines and viral pathology necessary to combat the virus if outbreaks balloon into an epidemic and grappling with the question of how government leaders should handle the worst-case scenario. The newly established Center for Communicable Disease Dynamics—where Lipsitch conducts much of his research—currently has 14 ongoing projects related to the H1N1 virus. Funded through the MIDAS program—an NIH initiative to gather information about how diseases spread—the center will receive more than $15 million over the next five years and has become hub of Harvard research on the disease. Research Assistant Justin J. O’Hagan, who has worked on several studies with Lipsitch, says that the Center will support a “critical mass of researchers” through collaborations with Harvard specialists as well as international scientists, journalists, and public policy experts. The Center focuses on research involving methods of disease surveillance, statistical analysis of infectious disease data, and analysis of infectious disease policy, according to Lipsitch. When swine flu first appeared in Mexico in the spring, it seemed that the cases were more severe than those reported in the United States, O’Hagan explains. In a study led by Lipsitch, researchers performed “disease surveillance” to determine the severity of the flu and see if the strain was similar in both Mexico and the United States. The group looked at the number of tourists traveling to Mexico from the United States, Canada, and the United Kingdom, who returned to their home country with swine flu and compared that number to those reported in Mexico. They concluded that Mexico was under-reporting cases and was missing a large portion of the mild cases, largely because such patients rarely seek medical attention. Another of Lipsitch’s team spent the summer examining the transmissibility of the H1N1 virus. “Depending on the characteristic of the epidemic, it will either die by itself, we can control it, or it will take over the world and kill us all,” says HSPH Professor of Statistical Computing Marcello Pagano. Pagano used statistical models to see how the data accrued, and how accurate it was at the time of the outbreak, he explains. “Given the quality of the data, we can say that this pandemic could be controllable,” Pagano says. The project was completed during the summer, before the swine flu vaccine was introduced. 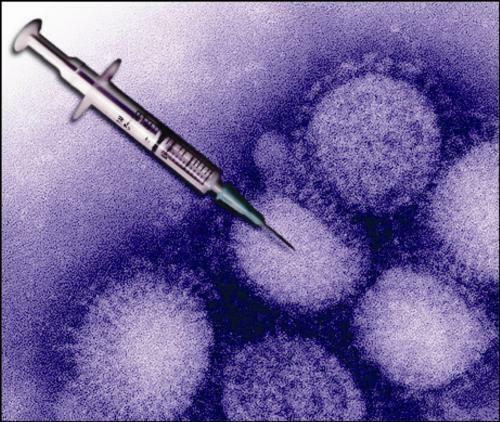 As treatment centers still wait for the H1N1-specific vaccine, two other recent projects at the center are related to the effect of traditional antiviral flu drugs on high-risk patients, and the transmission of H1N1 within households. HSPH Research Scientist Edward Goldstein was part of a team that included O’Hagan and Lipsitch, the head of the Center. The group suggested the use of Tamiflu—a common seasonal flu treatment—for high-risk patients, including pregnant women and the elderly. By giving the drugs early-on to individuals with a high risk of complications, the researchers hope to lessen the fatal effects of flu, Goldstein explains. A second project examined the transmission of H1N1 within families in Milwaukee, Wisconsin. The study presented data showing that early administration of Tamiflu was beneficial in lessening the possibility of transmitting disease within families, in addition to lessening flu symptoms, says Goldstein. “This study shows the benefit of people seeking medical attention early on,” O’Hagan says, adding that the study has been forwarded to the CDC and is waiting for publication. While much of the H1N1 research at Harvard is focused in the Center for Communicable Disease Dynamics, other experts are examining the disease through the lens of their own specialties. Wayne A. Marasco, a Medical School associate professor who also holds a post at the Dana-Farber Cancer Institute, has been researching the factors that may influence an individual to produce antibodies for swine flu and other influenza viruses. In addition to research on the ground level, a collaboration between HSPH, the Harvard Kennedy School, the CDC, and the U.S. government, is working on ways to train leaders in crisis management and leadership responsibilities—from dealing with terrorist attacks to natural disasters. Co-Director of the National Preparedness Leadership Initiative Leonard Marcus has been meeting with both health policy experts and White House representatives on how to cope with crisis. “We give an opportunity for leaders to make good decisions based on science,” he says. As the flu hits the Harvard campus this fall, Medical School Professor and Editor-in-Chief of Harvard Health Publications Anthony L. Komaroff has been involved in public outreach, including creating videos to show people how to protect their families from swine flu. “I think in the next few weeks we will see some policies issued, and the first swine flu vaccine given as early as October,” he said. For the Harvard researchers, much of the next few months will be a time of waiting, as they monitor the data of new swine flu cases and see if their hypotheses, which were based on initial research from the summer, were supported. —Staff writer Huma N. Shah can be reached at hshah@fas.harvard.edu. For recent research, faculty profiles, and a look at the issues facing Harvard scientists, check out The Crimson's science page.